The 57th Grammy Awards announced its winners Sunday night, with a grand ceremony and countless of memorable performances. 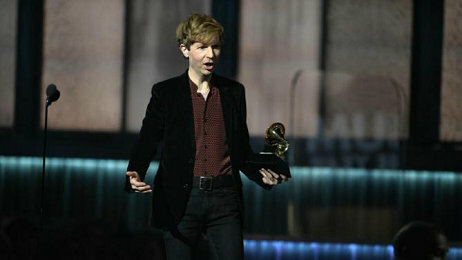 Major nominees including Sam Smith, Beyonce, Pharrell Williams received trophies that they deserve, while rocker Beck took home Album of the Year, to many surprises. 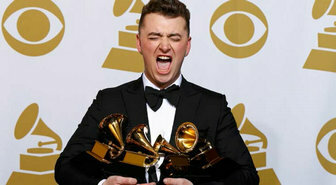 British soul singer Sam Smith was the big winner at the Grammy Awards on Sunday. The 22-year-old newcomer won two of the top Grammy awards for his heartbreak single "Stay With Me (Darkchild Version)," and also took home best new artist. His debut album "In The Lonely Hour" won best pop vocal album. "I feel like Kate Winslet at the Oscars right now. I've never done one of these. This is amazing. I don't know how to react right now. This is absolutely incredible. It's a dream come true. I'm the happiest I've ever been in my life," Smith said. Smith's win echoes that of fellow British soul singer Adele, who swept the Grammys with six wins in 2012 with her heartbreak album "21" and song "Someone Like You," also about a failed relationship. "Just a quick one, I want to thank the man who this record is about, who I've been in love with last year, thank you so much for breaking my heart because you got me four Grammys," Smith said. Smith is only one trophy away from becoming only the second male artist to sweep the four general categories, while rocker Beck robbed him of a sweep by winning Album of the Year with "Morhing Phase". The low-key veteran pulled off the surprise in the album category beating out Pharrell Williams, Beyonce and Ed Sheeran. The record won three Grammys on the night, including best rock album. "We made this record at my house, for the most part, so I'd like thank my kids for letting me keep them awake a little bit extra, longer," Beck said. In the country category, Glen Campbell bagged Best Country Song, while Miranda Lambert won for best country album. "Just kind of validates you to keep doing what you're doing when you're holding this. You know that what you're doing is working and that people are paying attention and they're enjoying it - it's moving people. That's why we make music is to move people, so this makes all that make sense," Lambert said.